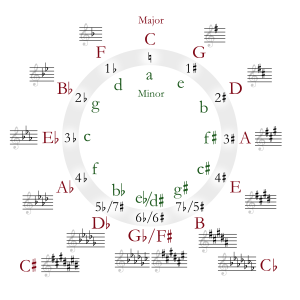 F minor is a minor scale based on F. The harmonic minor raises the E♭ to E♮. Its key signature has four flats. F minor is a key that people often link with passion. Some famous pieces in the key of F minor are Beethoven's Appassionata Sonata, Haydn's Symphony No. 49 in F minor, La Passione, and Vivaldi's The Four Seasons. In the Baroque period, music in F minor was usually written with a three-flat key signature. Some modern printings of such music keeps it written that way. The enharmonic equivalent of F minor is E-sharp minor. It is a minor scale based on the musical note E♯. Its key signature has six sharps and one double sharp. This page was last changed on 31 January 2019, at 11:52.